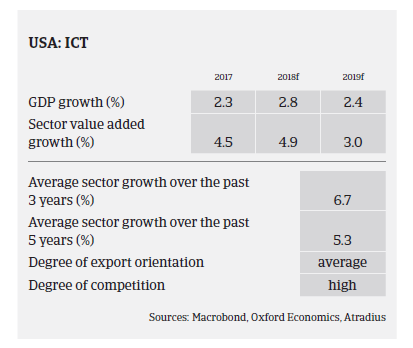 As in 2016, in 2017 the US ICT market benefitted from stable economic growth and robust private consumption, helped once again by wage growth, employment gains and still lower energy prices. Consumer spending has averaged close to 3% over the past few years, and this positive trend should continue in the short-term. According to the Consumer Technology Association (CTA), retail revenues in the US consumer technology industry are expected to hit a record-breaking USD 351 billion in 2018, exhibiting growth of 3.9% in 2017. Growth in the smartphone segment is expected to slow down somewhat, as producers face higher cost pressure due to the continuing price increase for key components. CTA expects sales of connected devices to reach 715 million units in 2018, driven by smart speakers/home devices, virtual reality (VR), drones, and wearables. However, consumers remain somewhat cautious in their discretionary spending and are continually looking for best value for price. Despite the healthy growth rates in many ICT segments, high competition is still leading to low pricing strategies and margin compression for distributors and retailers alike. The degree of competition remains fierce and margins remain under constant pressure. Any margin gains are likely to come from new product lines or a greater portion of sales being derived from services, which tend to carry higher margins. Margins of manufacturers are impacted by the already high market penetration of mature product categories and the subsequent need for innovation, which leads to higher R&D costs. Many ICT businesses continue to rely heavily on bank facilities and external financing, resulting in highly leveraged balance sheets. The resulting high interest can also have a substantial impact on net earnings and the ability to service such debt. The spread of maturity dates and ability to refinance at lower interest rates will determine any imminent risk. As most ICT companies are highly working capital instensive businesses, further draws or debt issuances are likely. Payments in the ICT sector commonly range between 30 and 90 days, but in some cases can take even 120 days. When payment delays occur, they generally relate to disputes over product pricing or other issues, as opposed to liquidity concerns. Manufacturers often offer price protection or discounts on products in order to move inventory ahead of the rapid innovation of technology experienced in the market. This can lead to disputes and ultimately an increase in non-payments until the issues can be resolved. ICT insolvencies are not expected to decrease in 2018, given the ongoing high level of competition, the abundance of start-ups and the ever short product cycles. Currently the impact of potential import tariffs and any deterioration of trade relations still remains to be seen. A first round of import tarriffs imposed by the US administration deliberately left out most ICT products. However, after China responded with retaliatory measures, Washington is looking for additional tariffs, likely targetting smartphones, computers and TVs, which in turn would lead to higher end prices. It is expected that US ICT retailers can absorb some of the costs to a certain degree, and some ICT companies are able to shift production from China to other countries, cutting the final bill for US consumers. Companies with complex supply chains, mainly those in high tech industries, are able to change the way their internal costs are charged among subsidiaries to lower their tariff bill. However, ICT supply chains would be hurt as ICT products assembled in China and exported to the US heavily depend on the imput of US-made components (semiconductors, software and other items). Therefore, there is a potential negative impact mainly on the component supply side, but also on the US end-consumer (higher sales prices) should Sino-US trade relations deteriorate. 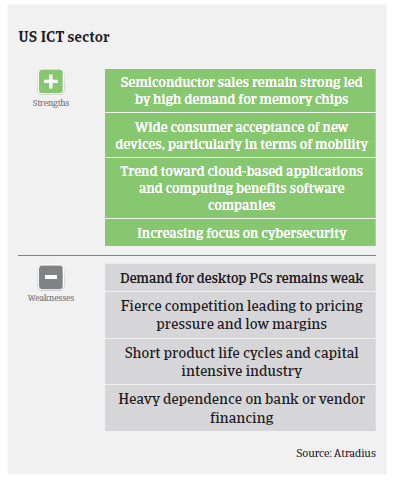 Despite the uncertainty surrounding tariffs, our underlying underwriting strategy remains cautiously open, with a focus on favourable subsectors such as smartphones, tablets and health technology products along with other emerging technologies, while steering clear of unfavourable or declining subsectors like PCs. Construction expansion is set to continue, underpinned by robust economic growth, with building businesses profit margins expected to remain stable.